True South offers ready-to-use coffee decoction for the filter kapi lover, that you can take with you wherever you go. Filter coffee from a pouch? The purist in us was skeptical when we encountered this odd creature at the Coffee Santhe 2015, but the folks at the stall persisted, suggesting that we try some, and we did. We were pleasantly surprised at what we tasted: hot, strong coffee, with a kick as if you’d made it right then. So why would you want to use readymade filter coffee decoction? If you’re someone who takes your filter coffee seriously, you probably have already invested in the right filter, the right bean, etc. But say you’re not – or say you’re of the lazy variety (ahem, that sounds like us) – we can imagine this working just fine. Or perhaps you miss your mother’s perfectly calibrated mix and want something close. The pouches also have a five-month shelf life, so if you’re shipping off overseas, these would make good nostalgia-filled gifts for yourself or friends and family. 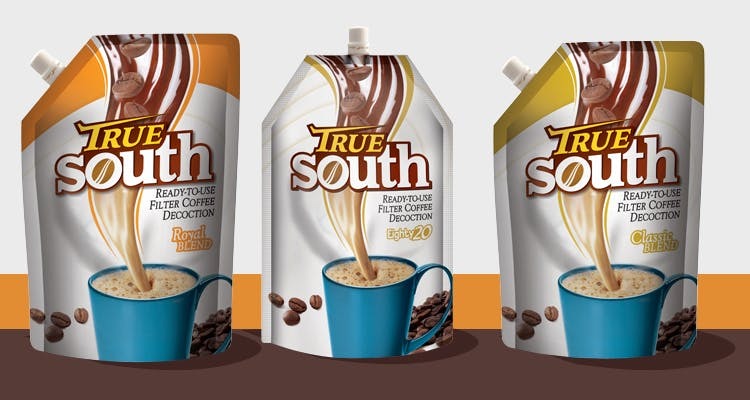 The folks at True South are coffee planters who wanted to make good coffee available easily, so they came up with the idea of making available ready-to-use coffee decoction (Just add milk and sugar, stir, and voila). The coffee comes from Coorg and Chikmagalur, so it’s from some of the best coffee-growing regions in India. The decoction comes in two varieties: Malabar and Bold, which vary slightly in the percentage of coffee and chicory they contain (the Bold blend has 80 per cent coffee and 20 per cent chicory, while the Malabar variety has 75 per cent coffee and 25 per cent chicory). They advise that you add one part decoction to five parts hot milk for a typical cup of filter coffee, or you could just make up your own proportions depending on how sleepy you are. You could either pick up their 250ml pouches, or opt to buy their bulk pack with 30 sachets with 20ml if you really want to make your coffee effortlessly.